MAARSSEN, the Netherlands – 3,760,000 bikes were sold in France in 2005; up a healthy 7% on the figure from 2004. This is reported by the French industry association Tous à Vélo. Despite the fact that according to these figures things look bright in France, one of the bigger local manufacturers is closing its doors due to ‘price madness’. The overall conclusion on 2005 bike sales in France is clear and simple. 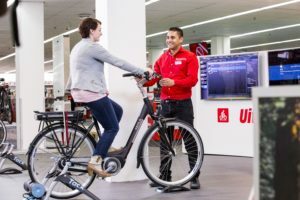 The big winners are the so-called Multisports supermarkets (Decathlon, Go Sport) that last year sold 47% of the units (1,784,000), for 35% of the total French turnover in bikes. The household supermarket chains (Carrefour, E.c. Leclerc, Champion, Intermarché, Casino) loose ground: their share in unit sales was in 2005 30%, and again a couple of percents lower than in 2004. The supermarkets scored a share in value of only 13%, and their average price for a bicycle was about € 100. This is where the pain is in France and especially for the suppliers of bicycles to these supermarkets. That ‘pain’ has even got to such a level that Accell stopped its business with supermarket chains in France. “Accell will cease its Supermarket business simply because there’s no longer any money to be made there due to what’s best called as price madness,” said a spokeman. This measure had end of 2006 drastic consequences for Accell operations in France. Accell’s subsidiary Mercier targeted this kind of business. The company was end of 2006 to cease its production in its facility near St. Etienne. Lapierre. 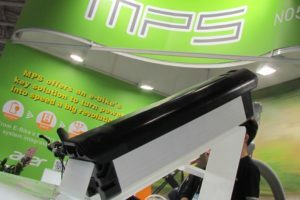 Accell’s other French subsidiary Lapierre, the one that is targeted to dealers, was to take over some of the non supermarket business of Mercier as well as a part of the staff. Cycles Mercier is one of the oldest bike makers in France. During the last years production level was at about 100,000 bikes with a current staff of 67. France’s national consultancy for bicycle professionals is called Tous à Vélo-Exclamation mark!- litterally translated: Everybody by bicycle. The way it is stated, in French, also contains an imperative element; ‘On your bikes, all of you, (you lazy bunch!)’. It is the slogan of the Conseil, who realize that a clever use of bicycles (and public transport) may help slow down car pressure. ‘Monsieur Vélo’, mr. Hubert Peigné, tells about the bicycle lobby in France, elsewhere on these pages. For although France claims the nr. 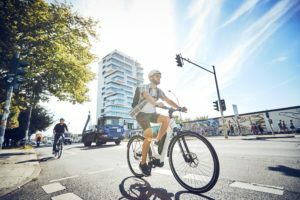 4 bicycle consumption per capita worldwide (after Japan, the Netherlands and the USA), France is not a country where the bike reigns as an individual means of transport. The car is the nr. 1 means of individual transport, the supermarket carts in France are exactly as big as the luggage compartment of the average French family car, many supermarkets sell petrol at the exit of their parking lots, distances to shopping/work/education have typically grown over the years to car dimensions. It will be extremely difficult to re-organize a national infrastructural pattern to bicycle size. Still, that’s what Tous à Vélo are after, on the long term. Fit in the bicycle wherever its convenience and speed exceeds that of the car. The French bicycle consumption is 3.8 million, it is a big country, and ownership is calculated at 6.2 bikes per 100 citoyens, but looking at the figures, only 173,000 of all bikes sold are city bikes, plus half a million hybrids. Bluntly stating, less than one-fifth of the French bikes are made for daily commuting, and the rest is for children and for leisure. So 700,000 bicycles per year should serve 61 million people on their daily trips to the railway station, the mailbox, the boulanger, church, the lot. It is clear there is still a lot to do to get a better coverage. Or said in a different way; The French adult buys on average just one commuter bike in a lifetime. 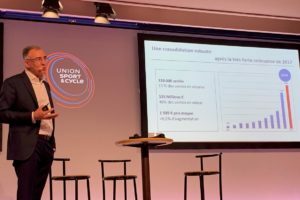 At the same time, France buys 1,300,000 mountainbikes, many of which are in the price bracket that is actually unfit for mountainbike sports: the average price of all mtb’s in France is € 248. So al lot of these bikes undoubtedly serve as commuters for schoolgoing youth, etc. The mountainbike as the ubiquitous for-all-chores. Real mountainbikes for real use in rough off-road riding will be considerably less – somewhere like the combined numbers of road racers (175,000) andBMX/bicross (150,000), which makes 325,000. Of course, France imports bicycles from the Far East and other cuntries just like anybody else. 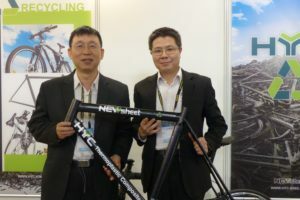 But there is still a substantial French industry: Cycleurope, MBK, Lapierre, Look, Time, Q-bike, Commençal, Cube, Cyfac, Follis, Sunn, etc., and even a couple of anonymous assembly plants for nondescript products. Some big-scale distributor networks like Decathlon get the majority of their bikes form the Far East, others (like Leclerc, Champion) support the French product, even with brand names from the past, like Helium. France imports foreign A-brands like Giant, Trek, Specialized, plus the whole range of high-end mountainbikes (Santacruz, Orange, Kona, Rockymountain, etc.) and road racers (Ridley, Merckx, Pinarello, Fondriest, etc. etc. ), and exports them (Lapierre, Commençal, Look, Time). The Multisports supermarkets (Decathlon, Go Sport) sell 47% of the units (1,784,000), and 35% of the turnover. their average price per unit is € 171. The household supermarket chains (Carrefour, E.c. Leclerc, Champion, Intermarché, Casino) loose ground: their share was in 2005 30%, again a couple of percents lower than 2004, 2003, etc. Their share in value was 13%, and their average price € 100. The IBD’s working under a formula (Velovert, Bouticycle, Culture Vélo, etc.) did 11% of the total French market – 429,100 units-, but 27% in value, with an average price tag of € 546. The indepenent dealers without chain support did 12% or 440,000 units, 25% in value and could boast an average price of € 495. The overall average price of a bicycle in France between 2001 and 2005 fluctuated less than 5%: € 240, 245, 243, 242, 231. In 2005, the total number of new motorcycle registrations in France increased with 7% to a total of 196,620. That is an absolute historical record. It looks as if congestion and petrol prices, not only in Paris, but in all major cities, are chasing a growing number of people from the car onto PTW’s. The big winner in this development is without any doubt the scooter. The 2005 result of 196,620 registrations was an absolute historical record. The record prior to this one dated back to 1999 when just under 193,000 new vehicles were registered. Whereas growth in 2004 was exclusively thanked to light motorcycles up to 125cc and MTT1 (< 25kW), last year all three categories progressed. MTT1 made the biggest leap forward, +14.1% to a total of almost 15,000 vehicles. Light motorcycles progressed with 8.1% to almost 85,700 vehicles. Finally, MTT2 (> 25kW) grew with 5% to almost 96,000 vehicles. This last result was still not good enough to recover from the loss, which this category had booked in 2003 and 2004, after exceeding the magical threshold of 100,000 registrations in 2002. In the category 125cc, scooters have the biggest market share since 2002 and the category continues to grow. Last year, their registrations progressed with 13%, for a total of well over 54,000 units. This resulted in a share in the 125cc category of 66.2% compared with 63.1% in 2004. With that, the number of scooters in last year’s 125cc top ten increased from 6 to 7. The Yamaha motorcycles DT 125RE and TW 125E sunk to the lower regions of the ranking. A motorcycle, the new Yamaha YBR 125 and a scooter, the Peugeot Elystar 125, took their places. The first immediately booked 2,759 registrations, enough for 9th position. The Elystar has been around for a few years and is increasingly successful. Last year, its registrations progressed with 17.5% to 2,114, which got the French model in 10th position. The success of these vehicles can be attributed to commuters escaping from traffic jams by switching to a swift, nimble and economical twowheeler. The trend started a few years ago in the Paris region and on the Côte d’Azur. Now it is spreading to all major cities throughout the country. Many of these cities are currently (re)building infrastructure for tramways, which causes additional traffic disruption. This combined with soaring petrol prices encourages even more people to abandon the car in favour of a twowheeler. These developments explain not only the success of the 125cc scooters but also the record-breaking result of the whole French motorcycle market in 2005. An ‘old retainer’ headed the 125 cc top ten. The Yamaha YP 125 Majesty booked almost 7,200 registrations, which is over 25% more than in 2004. It is quite probable that commuters swapping their car for a 125cc, opt for a vehicle of merit such as the Majesty. That could also explain why the Piaggio X8 125 was pushed back from the lead to second position, losing 11.7% registrations compared with 2004. This scooter was only introduced in 2004. Two years ago, Yamaha performed quite badly in the 125cc category and consequently fell from first to 3rd position. Honda then became the new leader, Piaggio came in second. In 2005, the Italian scooters sold so well that Piaggio took over the lead form Honda. It booked just over 19,000 registrations, i.e. +6.3%. After its major leap in 2004, Honda lost 7% in this category last year for a total of almost 18,200. Yamaha added 17.6% to its 2004 result. However, the total of almost 17,000 was not good enough to jump over Honda again. The category of +125cc scooters continues to expand: +30% in 2004, another 19.4% in 2005 for a total of nearly 8,500. With that their share in the total French motorcycle market rose from 3.9% to 4.3%. The average price of the vehicles sold in this category is remarkably high: € 6,835. French riders also have a clear preference for the really big models with registrations having an average of 447cc last year. Average price and cc seem to indicate that the newcomers in this class are often people who trade in their motorcycle for a T-Max or a Burgman. Yamaha consolidated its leading position in this category mainly thanks to the XP 500 T-Max. Suzuki remained in second position as a result of the Burgman 400 and 650 succes. With the total French market breaking an absolute record last year, all motorcycle types attained more volume, except the custom and sports segment. The first stagnated around about 3,900 vehicles. The second lost 11% of its volume. The strongest growth occurred in the segment of the +125cc scooter (+19.4%), the 125cc scooter (+12.9%), trial bikes (+10.3%) and big roadsters (+8.9%). The total 50cc market in 2005 is estimated at just under 170,000 vehicles. That is nearly 3% less than in 2004. Once again, the only winning category was that of the scooter: up 7.4% to almost 127,000 vehicles. Supplies of traditional mopeds were exactly halved to + 9,300 units. That comes down to a loss of 90% of its volume in 10 years’ time. To be or not to be, that is now a very real question for this category. Since their re-introduction in 1996, mopeds with gears seemed to open new perspectives for the 50cc market. The category steadily grew to almost 42,000 units in 2003. Two years ago, the fairy-tale has come to an end. Quite a few mopeds with gears do not comply with speed limit regulations and emission standards. Together with the number plate for mopeds, the French government has introduced a rigorous enforcement policy including exorbitant fines. As a result, the category is shrinking: almost 18% in 2004 and another 12% to 33,000 units in 2005. For many years, the 50cc market has been dominated by the ‘gang of 4’, Peugeot, MBK, Piaggio and Yamaha. Last year however, another significant player joined them. Kymco, in fifth position, tripled its results to a total of 7,800. This was to a large extent due to the new model Agility, only supplied from June onwards and yet estimated at 3,000 units.